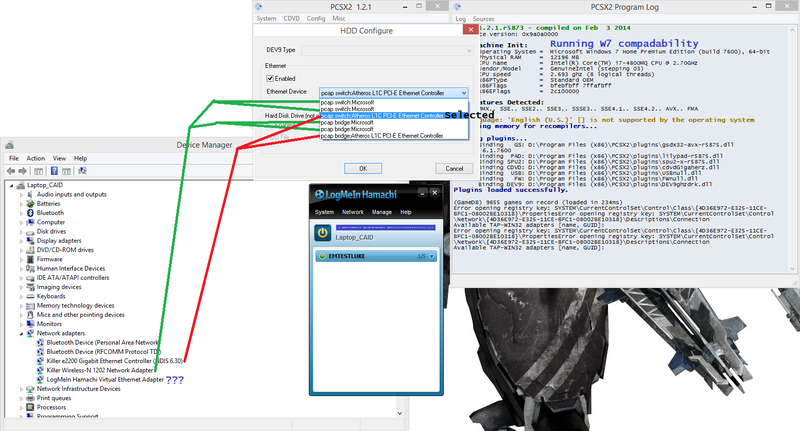 I'm trying to set myself up with the ability to play Armored Core: Last Raven with a friend via setting Hamachi's Virtual Network Adapter as the Network Adapter that the Dev9 plugin interacts with. Unfortunately I'm having some problems; one, that I don't have any kind of idea what the hell I'm doing; and two, that the information I'm managing to glean from all this mindless key-smashing isn't helping. - Configured some sort of network setting with a Network Adapter Startup Disc. - Properly setting up the Dev9 plugin. So I don't really know where to go from here honestly. I have 2 machines at home that I can use to test things, but the're connected to the same router and I am afraid of getting a false positive. I've deduced what adapters are what by enabling/disabling them in my Device Manager. I am currently using the Ethernet Controller as that's what my Ethernet cable is plugged into and my WiFi is off anyway. Does anybody have any insight/know of any information I can provide them with that will help them help me achieve my goal? did you manage to play through lan with your 2 machines @ home to start with ? because i don't think dev9plugin is able to do so. No, I don't have it set up on my other machine yet and my friend, understandably, went to sleep. I only suspect it may be possible because of what I saw when I was testing the online mode for AC:LR. it put me in a lobby that said waiting for other player to set something and showed a 1p option. I think the game might default to a lan setting of some kind but I honestly don't know what I'm talking about so I could be totally wrong. I can cry a screen capture of that and see if I can connect on my other machine when I get home if that might help. because most of the PS2 games work through game editor's servers, and I bet AC:LR servers a down now. Mind elaborating? I know most of the servers are down but what do you mean editor server? I can help you, which version of Game you got? I got US version somewhere. May be we can even try to play it online. Also read this guide, this may help you. (09-24-2014, 05:50 PM)prafull Wrote: I can help you, which version of Game you got? I got US version somewhere. May be we can even try to play it online. Wow I'm an idiot. All I needed to do was restart my PC for Hamachi to register as an Ethernet connection in Dev9. Thank you very much for your guide, I think this should work perfectly. I have the US version of AC:LR I believe (pretty sure); I bought it at a game stop some years ago. Okay so I've now used my other machine at home, set them both up, and connected them both to the same VPN in Hamachi. Unfortunately when I get to the network screen in AC:LR the machines don't see eachother. I'm wondering if the network play truly does work the way I thought it does, or if it is impossible to play LAN on AC:LR. As a secondary point I wonder if it is possible to play multiplayer at all; does anybody else have the expertise/past experience to help answer these questions? There seem to be a lot of things that could've gone wrong here, and I'm not quite sure where to start looking for what did. I tested the game yesterday. There seems to be a bug in this game and network adapter isn't getting detected properly. So most probably it won't work.